If you're looking to kick it old school by spending a small fortune on high-end RAM, Corsair will happily oblige with its new "extremely rare, exceptionally crafted" Dominator Platinum Special Edition DDR4 RAM. Stuffing your system with more RAM than you need used to be an expensive proposition. That hasn't been the case for quite some time now, though memory makers are still finding ways to charge premium prices for higher end kits. Usually that means bumping up the stock frequency or tightening the timings. Corsair's approach here is a little different. 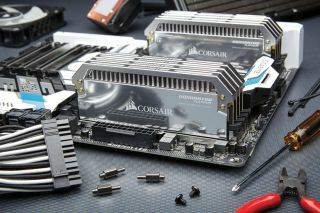 Corsair's going after "world-class PC system builds where only the most elite memory will suffice," and by elite, it means blinged-out and limited in quantity. These are individually numbered kits available in two finishes—chrome or blacked out. The chrome kits sport a heatspreader made from anodized aluminum that's been precision polished to a mirror finish and trimmed with sandblasted matte edging. Corsair's blacked out kit uses black anodized aluminum finished with polished black edging. They're then numbered with laser engraving. "Dominator Platinum SE modules are meticulously crafted with painstaking attention to detail, manufactured in limited edition quantities of 500, and individually numbered," said Andy Paul, Corsair founder and CEO. "These rather special and rare products will be enjoyed by an exclusive group of enthusiasts." There are four kits available, all 32GB in total capacity. They're all hand screened and outfitted with a 10-layer PCB, with Corsair saying they can be safely overclocked to at least 3,600MHz. In that regard, part of the premium price is going towards high end components. The top two kits carry an MSRP of $330 (£309.99) while the bottom two run $300 (£300).